Our client Totally Health, a specialist provider of Clinical Health Coaching services, are launching their new annual benchmark statistics on the efficacy and effectiveness of Clinical Health Coaching within patients with long term conditions, at this year’s NHS Confederation annual conference and Exhibition at Manchester Central (15-17 June). 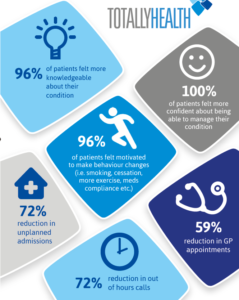 Totally Health help patients to better understand healthcare options, promote self-care and aid long term behavioural change which in turn impact on lifestyle and reduce healthcare reliance, re-admissions and emergency admissions. This is the first year that the Totally Health team is attending and exhibiting at the annual conference, which this year focuses on the huge effort that is underway in the NHS, and wider health and care system, to transform care for patients. The event welcomes a host of key NHS suppliers and partners allowing attendees to browse the latest innovations on the market and meet representatives to discuss challenges and potential solutions face-to-face.